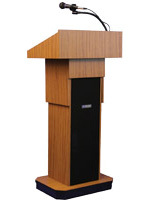 This adjustable height sound wireless mic lectern features durable wood construction with a rich red mahogany laminate finish. 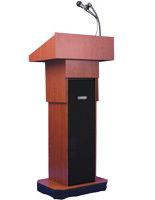 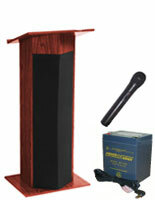 The portable podium features pneumatic adjustment between 39" and 45" high to accommodate a range of speakers or locations. 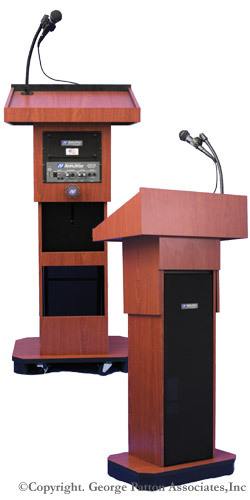 Each built-in sound wireless mic lectern comes with both a wired and a hands-free lapel microphone as well as a 50W amp and auditorim quality speaker system. 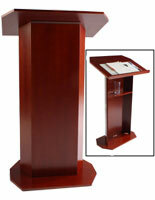 The portable pulpit podium's 24" wide reading surface has a book stop for stabilizing reading materials, tablets or notes. 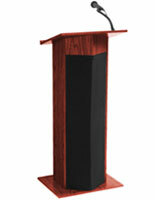 The mahogany finish wireless mic lectern is an ideal choice for public use for sermons, lectures, conference or meeting keynotes, lectures, speeches and readings. 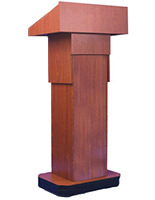 The pneumatic height control and rolling caster wheels (2 locking) make this presentation podium a perfect accessory for businesses, organizations and institutions.